Why should I call Iowa CTS Cleaners instead of cleaning it myself? Iowa CTS Cleaners’ technicians are trained and experienced in handling biohazardous material and the proper techniques in the decontamination, removal,transportation and disposal of blood & bodily fluids. Improper handling of biohazardous waste can lead to serious health risks. In most cases our services are covered under homesowners, business or auto insurance policies. However if the situation is due to a violent crime, the Iowa Crime Victim compensation program will pay up to $1,000 for clean up and we can help with the paperwork. We can also work with you to set up low monthly payment arrangements when services are not covered by insurance. We have technicians on call 24 hours a day 7 days a week ready to respond. Since we are located centrally in Grimes (Des Moines), we can respond just about anywhere in Iowa within a couple of hours. Have more questions? Just give us a call at 515.554.3834. A biohazard is blood and other potentially infectious materials(OPIM). In most cases, homeowners, business or auto insurance will pay for bio-recovery services. However if the situation is due to a violent crime, the Iowa Crime Victim Compensation program will cover up to $1,000.00 towards the clean up and we can provide you with the paperwork. Ultimately, the property owner is responsible for the cost of the service. Can I just have one of my employees to clean the scene? A proper method to remove and properly dispose of the biohazardous waste in a properly marked container for disposal at an approved site. Penalties for violation of these regulations can be severe. Additionally, an employee may file a workers' compensation claim and/or lawsuit. How long does it take for someone to arrive? Our phone is staffed 24 hours a day 7days a week, Our office is centrally located in Urbandale Iowa so it may be as little as a few minutes to a couple hours based on drive time. It varies greatly depending on the location, circumstances, and services being performed. Most of our jobs take somewhere between 2 hours and 5 days. What condition will the property be in when you're done cleaning? The property will be clean, disinfected, deodorized, and safe for habitation. All contaminated structure (floor covering, subfloor, dry wall, trim, paint) that needs to be removed will be removed. Our restoration/ reconstruction service will arrange to have everything replaced while working with you, the customer, to choose paint colors and floor coverings. We will take care of everything for you from start to finish! I don't want to draw any attention to the scene. Do you work discreetly? We are very sensitive to the emotional needs and privacy of our customers. All our vehicles are discreetly marked and we work in as professional and discreet a manner as possible. Why choose Iowa CTS Cleaners? 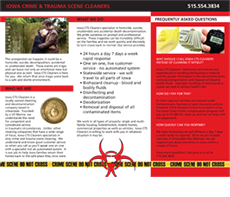 Iowa CTS Cleaners relieves owners, managers, co-workers, family members and friends from the emotional trauma and physical hazards of cleaning a crime or trauma scene. We are fully trained and equipped for handling biohazardous waste and decontamination, so you can feel confident the scene will be clean and safe when we're finished. Following a natural death, homicide, suicide or medical emergency, biohazards are left behind. We will remove these biohazards from the scene, safely and discreetly, sealing, labeling and disposing of them at the appropriate medical waste disposal facility. The affected area is then cleaned, disinfected, deodorized and restored to a safe condition. If necessary, carpets, sub floors and sheet rock can be removed and replaced. No problem, just fill in this form and we'll get back to you immediately or call us at (515) 554-3834.